Summer is in full swing, which means there is a ton to do in Los Angeles. The Hollywood Forever cemetery movie screenings produced by Cinespia are selling out every weekend. We went to Gentlemen Prefer Blondes and had a blast. The movie is funnier than I remembered, with a witty Jane Russell and an over-the-top Marilyn Monroe performance as a woman obsessed with diamonds. The camera nearly ignores the very funny Russell, in favor of the overly sexualized Monroe, in an otherwise strangely gay musical. There is a pool scene that looks like the Village People’s YMCA. If movies aren’t your scene, how about music? The Hollywood Bowl has something every night of the week, and we caught the Robyn and Röyksopp show with a big group of friends. My new summer music favorite however is Sia, whose new album just dropped and it’s terrific. It’s also been a summer of guests and pool parties. Our friends Trisha, Kevin, and their daughter Mason stayed with us, and Krista, Roger, and their son Charlie came for a visit from Cincinnati. I love when some of my favorite people visit and different worlds collide in new places. We have also been swimming a lot this summer so thanks to Gabi, Trevor and Joey, Ken and Carey, Tom, and John for the much appreciated pool time. If theater is your thing, the annual Hollywood Fringe festival just happened. We caught a very funny play called No Homo, written by Brandon Baruch, who happens to be the son of a friend of ours. We went to support a friend and ended up seeing the winner of the Best World Premiere production, among other awards. Well done, friend’s talented son and the cast! This weekend we’re headed Jackie Beat’s new show on Saturday night at the Renberg Theater, so if you’re looking for some edgy humor, she’s got the beat. Last Monday we went to the LA premier of Such Good People written by our friend David Michael Barrett! Randy Harrison and the very funny Michael Urie star in this screwball comedy about a money grab in Silver Lake. The movie also includes standout performances by Ana Ortiz, Alec Mapa, and Drew Droege. We went to the cast party afterwards with the likes of Urie and a blue-blonde Lance Bass. Two nights later I was out to dinner in West Hollywood at Pump, and Lance Bass was there again. I like your new hair, but stop following me Lance! We were brought to dinner by our friend Andy, who is a huge he fan of the Real Housewives of Beverly Hills. I don’t watch the show, but I thoroughly enjoyed watching Andy’s expression as Lisa Vanderpump, her husband, kids, and other cast members took the table right next to ours. He was essentially watching live tv for the rest of the meal. The food at Pump is very good, not great, but the atmosphere is lovely. I have to give credit to Vanderpump for turning a cursed location and dingy parking lot into a stunning new destination, with beautiful old olive trees and every chandelier in the Restoration Hardware catalogue. While I’m on food, I have another recommendation for you. Hoy-Ka Thai Noodles just opened up on Sunset Blvd in Hollywood around the corner from my house and it’s delicious. I love Thai food and there are many choices in the neighborhood, but these are some of the best noodle dishes I’ve ever had. Albert and I were sitting at a tall table when a woman came over and told us that we chose the “Hoy-Ka” table, which translates to “dangle your feet.” She and her husband are the owners and are super nice, and talked to us during much of our meal. They had the same restaurant on Western in a smaller location and always had a line out the door, so when they moved, their fans followed them. Everything is fresh and homemade, and they have the most delicious egg rolls I have ever tasted in my life. Give the place a try and sit Hoy-Ka! 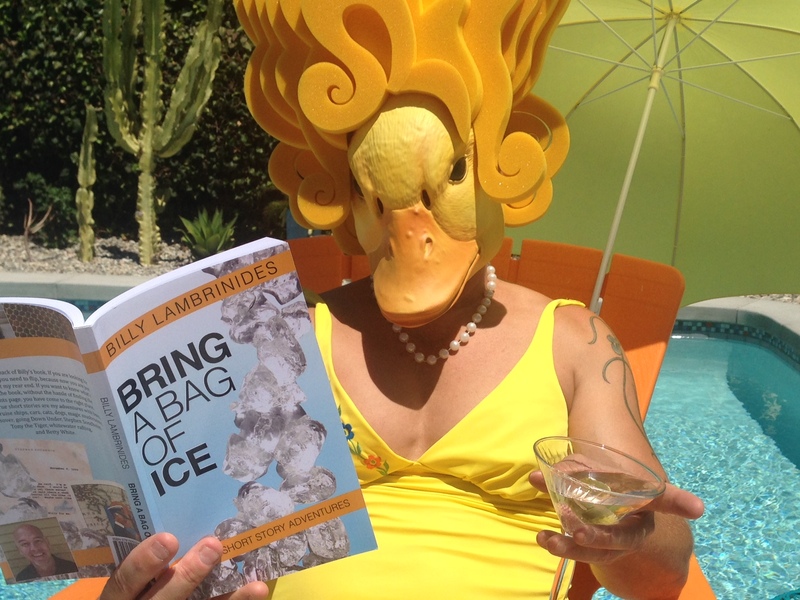 A special thank you to all my friends who have posted pictures with my new book. I appreciate all your help with sharing my book with your friends, like Prudence did (above), and giving me much needed publicity. I realize that I disappeared again but this time I have an excuse. I was busy finishing my new book, and it’s done. 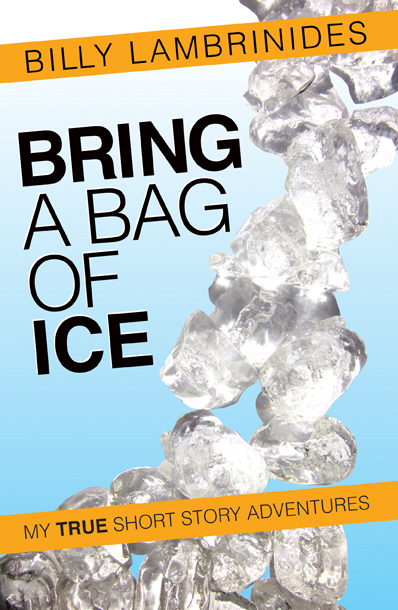 I am thrilled to announce that my book Bring a Bag of Ice is available for purchase on Amazon, so please check it out. This collection of true short stories are my adventures assisting an allergic beekeeper, singing on cruise ships, whitewater rafting, playing Tony the Tiger, meeting Stephen Sondheim, being a chorus boy for Betty White, going Down Under, and much more.